Europe is not a great power although it would meet all the preconditions needed. Its effectiveness is hampered due to its inertia and lack of common positions on nearly every foreign policy challenge. The lack of an efficient decision-making mechanism has lead to a ‘consensus-expectation gap’, scaling the EU down to the place of a small power in the emerging multipolar world order. Let me start by stating the controversial: the EU is not a great power, nor is it on the path to becoming one. This will disappoint friends of Europe who tend to take it for granted that the EU will take a seat at the high table in the new multipolar order. Seen from the outside such ambitions seem reasonable. As it stands in 2011, the EU displays all the characteristics of a giant, except the outward trappings of power. Regardless of indicator, be it GDP, population, industrial strength – even combined force of arms – a united Europe would easily overshadow the other rising powers. European integration has been a story in which sprints of intense activity have been followed by prolonged periods of inertia, followed by renewed optimism, followed again by disappointment. 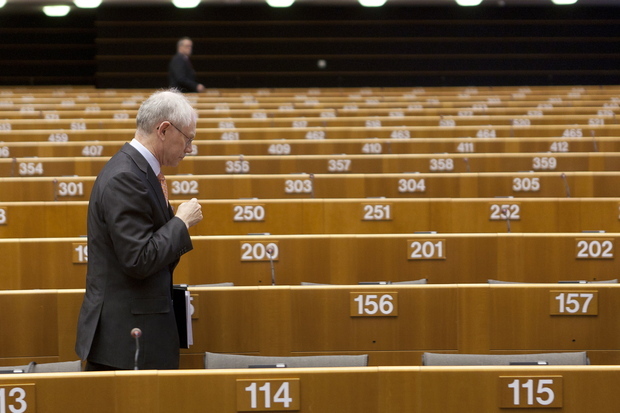 In 2011 the EU finds itself in another depression. Over the past decade a new element of competition, of scarcity and volatility has made political time pick up speed, driving the emerging powers faster, higher and stronger. But not the EU. It has grown increasingly apparent that a weaker United States will not automatically translate into a stronger European Union. On the contrary, looking at the issues that dominate the news headlines, the EU is rarely a factor. The flurry of integration of the 1990s achieved some progress towards a ‘common’ foreign and security policy but important issues unresolved, namely delivering a workable political support system for foreign policy integration; the inability to fund the venture, stemming in part from taking in 12, in a relative sense, underdeveloped new members without fundamentally changing the redistribution mechanism, and, finally, the lack of a EU raison d’état to inform policy, as illustrated by the lack of common EU positions on almost every single major foreign policy challenge. There are particular concerns over its security and defense dimension where attempts at pooling resources and forming a political consensus have failed to deliver the results expected. The ongoing shift in global power patterns, have been accompanied by a shift in EU strategic thinking whereby great-power ambitions have been scaled down and replaced by attempts at ‘hedging’ vis-à-vis the leading powers, avoiding to ‘put all its eggs in one basket’. On an operational level the track record shows that the EU’s effectiveness is castrated by a ‘consensus-expectations gap’, owing primarily to the lack of an effective decision making mechanism. The sum of these developments is that the EU is taking the place of a small power in the emerging multipolar international order. In 2008, under the French EU presidency, President Nicolas Sarkozy made a determined effort to breathe life into the sprawling EU foreign policy frameworks. With American support the French sought to make the EU the focal point of European security. The efforts failed due to a lack of support in London and in Berlin. Perhaps this should not come as a surprise that a union that for the most part is made up by small and middle sized players should take the strategic outlook of a small power. In addition, there is the temptation of appearing insignificant. It is always tempting to let others expend blood and treasure in upholding the international system. In the previous century Europe only just avoided perishing from great power politics and utopian ideologies, it would now seem that it opts for abdication. If the current path is continued the great decisions of the 21st century will be made other places than in Europe. Asle Toje is a visiting fellow at the Norwegian Nobel Institute (Oslo) where his research interests are found at the intersection of security studies and development studies. Since graduating with a PhD in 2007 from Pembroke College, Cambridge, he has published extensively on European security and development policies. His most recent work is: The European Union as a Small Power: After the Post-Cold War. (London, Macmillan, 2010).